Super Hero Boy: Why wait for the christmas specials to come on tv? Why wait for the christmas specials to come on tv? In my childhood holidays were about two things, amazingly good food and holiday tv specials. Christmas was the mecca of the tv holiday specials and a good amount of time went into planning which specials you were going to watch when. Back then that was pretty much the only way you got to see them and I can remember being disappointed when I missed my favorites. Now there is no need to wait, you can watch some of my own childhood favorites anytime you wish from your own dvd player. Actually even better, they are available on bluray as well, strike that, even better than that you can get them as bluray combo packs! Yep you heard me a bluray, dvd, and digital copy all in one. Talk about having unlimited options on how to watch them! The first is a all time classic, A Charlie Brown Christmas, actually this is the one Peanuts special that I really really enjoy. Snoopy dancing on the piano is a must see iconic Christmas moment as far as I'm concerned. One thing I should note however bout the bluray version is, this is a 40 year old cartoon which was never really the best animated cartoon ever to begin with, mind you the joy of Charlie Brown has nothing to do with his fancy animations or great soundtracks its the story and well Snoopy in my opinion that makes the story. With that said I'm actually quite impressed with the quality of the picture. It's noticeably brighter and easier to hear than previous versions but you will see some graininess in the picture and even some background noise. Still a huge upgrade from my circa 1980s video recording. 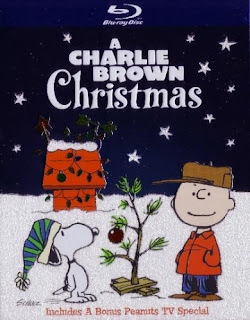 Along with the Charlie Brown Christmas special you also get It's Christmas Again, Charlie Brown and The Making of A Charlie Brown Christmas included on the dvd. All in all its a short film about 25 minutes. You can pick up your own copy of A Charlie Brown Christmas in bluray/dvd combo pack right now on Amazon. Now to undeniably one of my favorite Christmas specials of all time only slightly topped by that one we all know about a reindeer. How The Grinch Stole Christmas. This one has been sitting in my dvd collection for years and comes out every Christmas well before I ever had kids. There are Grinch ornaments on my tree, many of which predate kids, and It was one of the very first Christmas shows I ever showed Connor. Now available in a bluray/dvd combo pack you can own one of my own favorite Christmas movies in enough formats that you can watch it anywhere you go. Its been playing almost daily here for days both in the living room on bluray and in Connor's room in standard. As for the video, again just like Charlie Brown this is an older cartoon which was not exactly high budget for its time. However the transfer is nice, much of the grainyness from our previous version is gone and the audio is much improved since the version we last owned. Its a fairly short video so I guess I assumed they would include a ton of extras seeing as there is no way this movie even comes close to taking up a bluray disc. Heh. Though there are some extras including a Making of video, some extra songs, and some other extras involving the production and musical selections it seems a little short. Regardless its a huge upgrade from our last standard version we purchased five or six years ago and the fact that we now own a bluray and standard version copy is well worth the upgrade cost! You can pick up your own copy of How The Grinch Stole Christmas in bluray/standard combo pack right now on Amazon!